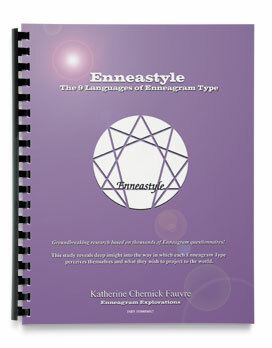 Self-Image, language use and Core Motivation/Fears of each Enneagram Type, Tritype® and Instincts. Save 20% when you buy all our physical products in one order. Click here to save! your products often within a few days anywhere in the US. International orders take longer per each countries customs poicies. Recorded live this fascinating lecture masterfully takes the audience along a journey of self discovery. Listen along as David and Katherine present their latest research findings on the Tritype, one's dominant Type in each Enneagram center: Head, Heart and Gut. Intro to the Enneagram & The Instinctual Subtypes, mp3 download • 45min. Focuses on what brings Fours to their greatest spiritual and psychological health. This is a 60 megabyte download. Please use a fast internet connection to download. Click play to hear a testimonial! Instinctual Subtypes Professional Lecture mp3 download • 60min. 90 page booklet with 27 color collages or PDF! Based on hundreds of coaching sessions and tens of thousands of Enneacards Test and Enneastyle Questionnaire results, research confirms we each have not just one, but three Enneagram Types. 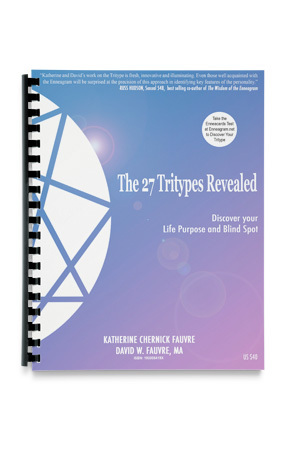 This booklet reveals for the first time the 27 Tritype archetypes. This ground breaking information is presented using easy to read tables and color collages for each Tritype archetypal combination. • Learn what your Tritype reveals about your life mission. • Discover the basic concerns of each Tritype combination. • Discover the Core Fear of each Enneagram Type. 5 hour, 4 DVD set or digital download! Did you know you have 3 Enneagram Types? We call this your ‘Tritype’. Based on hundreds of coaching sessions and tens of thousands of Enneacards Test results, research confirms we each have not just one, but three Enneagram Types. Your unique Tritype combination identifies key aspects of your personality which when understood, can illuminate the path to greater self-awareness and a more fulfilling life. Your Tritype is your Enneagram Type in each center of intelligence: head (567),heart (234) and gut (891). Although one Enneagram Type is dominant, you also use two other types in a preferred order. The three types within your Tritype intersect, creating a unique defense strategy and focus of attention. The high side of this intersection is that it gives your life direction, focus and purpose. The low side of this intersection, is that it creates a blind spot which narrows your ability to self assess which may keep you unaware of your full potential and keep you stuck in self defeating patterns. $59 for the digital download. Get it now! $59 for digital download. Watch it now! 2 CD video discs or digital download! Plays on any PC or Mac. "Did you know the nose of the 4 often turns to the left and 8s often have strong jaws? 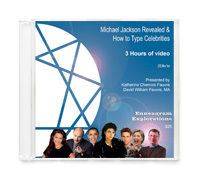 Over 3 hours of master level video instruction on how to type anyone including celebrities. Learn how to identify type by facial structure, micro-expressions, body type, language use and more. These two webinars which were recorded to video were the most popular programs we have ever offered and have been watched by thousands around the world. $17 digital download, watch it now! 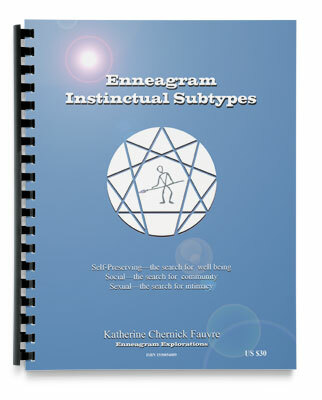 Newly updated, this is the definitive resource on the Enneagram Instinctual Subtypes, a true 'must' have for the Enneagram enthusiast. Self Preserving-the search for well-being. An in-depth compilation of all 27 subtypes as described by Naranjo. Palmer, Riso, Hudson, Condon, Rhor, Baron & Wagele and others as well as in the "verbatim" language of the Enneagram types themselves. This research booklet includes the major authors descriptions of the Instinctual Subtypes, the internal versus external perception, point bias, cultural bias, stress and security, look-a-likes, color photo collages and results of the latest research. "The Best work on understanding Enneagram Instinctual Subtypes." "The Instinctual subtypes of the enneagram have previously been briefly described by several authors. 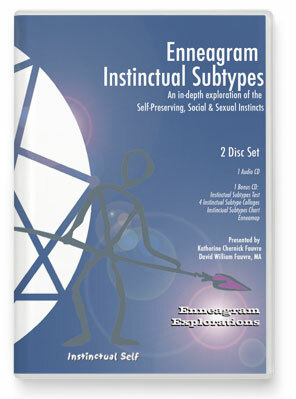 Ms. Chernick's book is the result of a review of the available literature on the instinctual subtypes, information from several courses she attended on the enneagram (she's studied with just about all of the most prominent enneagram teachers), and her own interview and questionnaire research. The outcome is a very good compilation of the personal traits of each of the ennea types(Enneagram Type & Instinctual Subtype combinations: for example Sexual 8, Social 8 and Self-Pres.8 ). There are more descriptions and nuances for each type than in any other work presently in print, and it creates a clearer picture of each of the ennea types. It is especially good at helping to make distinctions between Type/Subtypes that may appear similar. ... the information is excellent. The writing style puts the content in a list format for easy reference." "Through her original work, Ms. Chernick Fauvre, has provided the reader with the added visceral dimension of learning beyond a dry portrait of each subtype. The use of colored pictorials, matrix charts and anecdotal evidence provide the reader the opportunity to get a real sense of how each subtype represents him or herself in the world both visually and verbally; not just what they will do but how they do it. I highly recommend this work as well as her work on the nine passions in which she also employs use of visual and verbal insights. " The visual presentation & language inherent to Enneagram Type. based on the results of over 4,000 questionnaires!" The 9 Languages of Type-Image is our non-verbal message to the world. 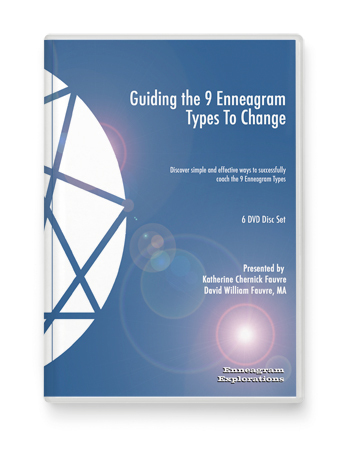 Discover the 9 motivations of image and the distinct language inherent to Enneagram type. Illustrated with 9 color collages, this innovative booklet documents the ongoing study of 'Enneastyle', the correlation between the Enneagram and the world of image and self projection. This study reveals, as reported by the types, the 9 distinct ways the Enneagram types perceive their visual image and what they ultimately wish to project. $18 PDF Version. Read it Now! "As in her book on Instinctual Subtypes, Ms. Chernick-Fauvre, has provided the reader with the added visceral dimension of learning beyond a dry portrait of each subtype. The use of colored pictorials, matrix charts and anecdotal evidence provide the reader the opportunity to get a real sense of how each subtype represents him or herself in the world both visually and verbally; not just what they will do but how they do it." over 200 psychotherapists, perfect for the car!" Edited lecture given David W. Fauvre, MA and Katherine Chernick Fauvre on the Enneagram & Psychotherapy presented to the California Association of Marriage and Family Therapists at the 1999 Annual Conference. 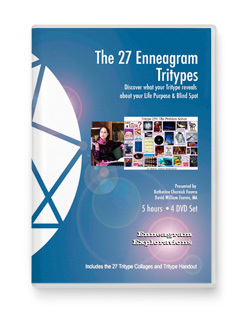 Contains in-depth explanation of the core motivations of personality of each Enneagram type as well as what each type finds helpful in therapy. Appropriate for mental health professionals and anyone seeking greater understanding of Enneagram type motivation. Enneagram, Coaching & Psychotherapy mp3 only $17! Get all 2 hours of audio now! This is a 20 megabyte download. Please use a fast internet connection to download. Download all 5 hours as an mp3 pod cast now for only $19! 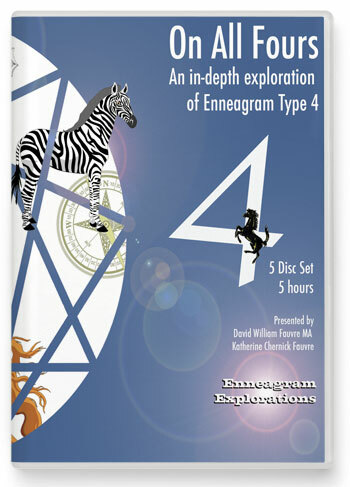 This set focuses on what brings Fours to their greatest spiritual and psychological health. Learn how to open to your natural sense of origin, recover your positive aggression, and trust your creativity and intuition. Hear 4s reveal their private and intimate experiences of being a Self Preservation 4, a social 4 and a Sexual 4. This is recommended for Fours and those in relationship with Fours. On All Fours mp3 pod cast only $19! Save 60%! Get all 5 hours of audio now! Same audio as listed in CD set above. This is a 60 megabyte download. "Katherine and David are gifted teachers with superb presentation skills. Their research is a major contribution to the field and a must have for anyone interested in the Instinctual Subtypes. We highly recommend their work. " or buy the audio portion as an mp3 and download it now! "Did you know your Instinctual Subtype determines your fundamental survival strategy as well as your compatibility with others?" Packed with insights, this concentrated master class on the Instincts reveals how our lives are run by our dominant Instinctual Subtype and it’s influence on relationship compatibility. Learn how to identify your Instinctual Subtype and how it impacts your Enneagram Type in every aspect of your life. This set features the live NCIEA presentation and also comes with a second track which includes an Instinctual Subtypes Test, 4 Instinctual Subtype Collages, an Enneamap and an Instinctual Subtypes Chart filled with in-depth information on all 3 Instinctual drives! If you are unhappy with our physical products: booklets, Enneacarsds, or CDs or an online test you can return them for a full refund, not including shipping, if they are in like new condition for a period of 14 days after your order was received.